Earl (Vern) Yenglin, age 85, passed away on Saturday, January 26, 2019, at Vista Springs, Washington, Michigan. Earl was born March 3, 1933 in O’Neill, Nebraska, the son of Earl and Emily (Spry) Yenglin. Earl and his family moved to Romeo in 1941 where he graduated from Romeo High School in 1952. After graduating, Earl joined the Army and served two years. Upon returning from the Army, Earl married Sharron Totten on March 17, 1956. 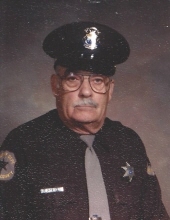 Earl began at the Macomb County Sheriff Department in 1960 where he worked as a Deputy Sheriff until his retirement in 1992. He was also a volunteer fireman at the Romeo Fire Department and then the Bruce Township Fire Department from 1957 to 1984 and retired as Captain. Upon retirement from the Sheriff Department, Earl had more time to camp and travel with Sharron. Earl was long time member of the Romeo United Methodist Church. Earl is survived by his wife of 62 years, Sharron, of Romeo; children Lynda (Larry) Grillo of Clinton Township, Bill (Kim Jackson) of Lake Orion, and Michael (Mary) of Dryden; grandchildren Bryan Yenglin and Ashleigh (Corey) Villalpando. Earl was preceded in death by his parents; infant daughter Ruth Ann; granddaughter Alexis; and siblings Dorothy Spens, Marie Campbell, Margaret Toothacker and Janice Faye Yenglin. In lieu of flowers please consider donations to the Romeo United Methodist Church. Funeral Service will be on Monday, February 4, 2019, at 11AM at the Henry M. Malburg Funeral Home. Memorial Visitation will be on Sunday, February 3, 2019 from 1PM-5PM also at the Henry M. Malburg Funeral Home. To send flowers or a remembrance gift to the family of Earl Lavern Yenglin, please visit our Tribute Store. "Email Address" would like to share the life celebration of Earl Lavern Yenglin. Click on the "link" to go to share a favorite memory or leave a condolence message for the family.